BRO - Black River Outfitters - is conveniently located right on the shores of the Black River in Watertown, NY. We launch our 7-mile, 12-rapid, guided raft trips right from our backyard - right above one of the best known whitewater play spots in the country! The Black boasts solid Class III/IV rapids and trips are available from May through mid October. The Black is unique as it offers reliable whitewater even during the drier summer months. Warm water, thrilling rapids, and beautiful sunshine make this a do-not-miss trip. Everyone AGES 14 AND UP can participate in this action packed, fun filled adventure! 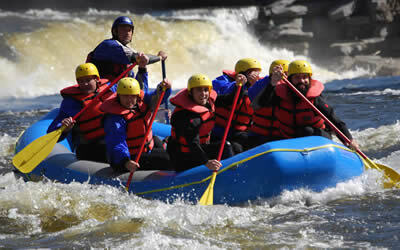 Every trip with BRO includes an in-raft, highly trained, NYS licensed whitewater rafting guide. You will be provided with all the necessary equipment and training you'll need to help navigate your raft through the adventure class whitewater you'll encounter throughout your day. BRO offers the newest and most up to date rafting center that includes an outfitter shop where you can find that perfect, must-have t-shirt, or just laugh at the photos taken of your trip as they scroll across the big screen. You can also relax in our picnic area along the shore of the Black River while you enjoy your complimentary ice cream and watch the kayakers as they practice in the re-circulating water of our home rapid, "Hole Brothers." We are conveniently located on the shores of the river in Watertown, NY. Just 3 miles off Exit 47 of Interstate 81. Close enough for a day trip, but far from the hustle and bustle of everyday life. We know how to play, and a day with us will leave you feeling energized and refueled!